After one year of intense work (and some 10 years planning!) the Duomo Museum finally has reopened and it is going to be a highlight of your next Florence visit. The museum represents the ideal completion of a visit to the Duomo and Baptistery, and allows an in depth knowledge of the development of the sites in terms of architecture, decoration, and art, since there are more than 750 pieces on display. Very cleverly designed you can really tailor your visit according to your available time and focus on the masterpieces, or you can really spend a long time in this comfortable space. The main room offers a fabulous 1:1 reconstruction of the original facade of the Duomo, as planned by Arnolfo di Cambio at the end of the 13th century. It was only built up to one third, but following the death of the artist and the change of taste it was never completed, and was dismantled in 1588: some statues were saved, others destined to gardens or sold. The room of the facade (or of “paradise”, as it is called) was formerly occupied by a theater and recreates the effect of the sculptures beautifully. There are more than 50 statues, large and small, back in their original locations. The original doors of the Baptistery are on the wall opposite to the façade, (the older one by Pisano is still missing but has already a space planned for it). The display allows at the same time the conservation and the close-up view of the doors (and of their backside). They are considered the masterpieces of Lorenzo Ghiberti and after their long restoration it is amazing to rediscover the effect of gilding and the careful details. 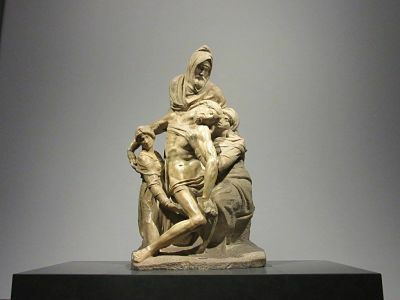 The other rooms on the ground floor are dimly lit to allow an intimate view of the late Pietà Bandini by Michelangelo and the excruciating Mary Magdalen by Donatello. They are both works conceived in maturity by these two compelling artists and are charged with spiritual tension. The other floors are coherent in trying to recreate original locations and thematic consistency. The gallery of statues is an amazing sequence of 54 reliefs and 16 statues by Andrea Pisano, Donatello and many others that come from the bell tower. There is of course a large salon fully devoted to Brunelleschi’s dome: video, models and some of the (original!) tools used in the construction site are really helpful to better understand its concept. There are of course paintings, choir stalls, the former silver altar of the Baptistery ( 440 pounds of amazing goldsmithing), wooden scale models of different parts of the buildings…well the secret for not getting lost is to follow the direction marked by the star on the floor or simply contact us for a guided tour. After a last flight of stairs you will get to the terrace overlooking the dome (so close) and the skyline of Florence: an amazing view in any weather and any season.